Organizing Your Clothes Can Truly Change Your Life! Imagine that every morning you easily find what you need to start your day and look your best. Creating order in a clothes closet, whether it is your own, one you share with a spouse, or one for the kids, will make getting dressed fast, simple, and maybe even enjoyable. Who wouldn’t want that? Knowing what you have and being able to find it maximizes your options and helps your wardrobe feel more versatile. If you can find it, you can wear it. Are your closets cluttered with stuff that doesn’t belong in there? Can you close the drawers on your dressers? Are you frustrated by lack of storage? It may be time to tackle that closet, those drawers and organize your clothes. New England homes are notorious for inadequate storage. Thankfully there are many solutions, most of which don’t involve installing a new closet system. Of course, if you have your heart set on a new closet, I have some wonderful vendors that do beautiful work. What are you waiting for? This project will certainly change your life! Simplify your laundry, simplify your life. The laundry routine of a home greatly impacts the organization of clothing in that home. How is your laundry system working for you? Is there a clear and simple routine in place? Is there adequate space to handle both dirty and clean laundry? 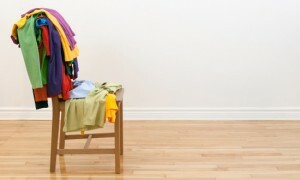 If all the laundry in your home were clean, would it fit neatly in the closets or drawers? After many years of organizing, I understand the impact that inadequate closet space and disorder can have on a household routine. It’s truly gratifying to see people become more positive and even a little more energetic after working on their clothing and laundry. It’s amazing what a difference this project makes! Thank you Heather!! I appreciate all your time and energy. How do you stay so energized? I started to feel mentally exhausted after an hour and a half but your sparkle pulled me through. I really do feel great about the progress made on Monday! You have such great ideas!! Thank you again for all your kindness and inspiration.